I don't really have a proper blog entry this week. The cough and cold turned in to full blown flu and I spent most of the week in bed. Then the asthma really kicked in and I have had to give in and take antibiotics and steroids. The medicine has started to kick in and I will be back at work tomorrow, but I have done nothing all week - no sewing, no cooking, I didn't even feel up to reading. However, I would hate to think anyone popped in to check my blog and found nothing but a whinging old sick person, so here's a photo of our cats sharing my work chair. At least, I call it my chair, but if as they say possession is nine tenths of the law, then I guess it is more Max's chair...! Mark was talking about the need to buy another chair, but one more would only mean the cats would have a chair each - I would still be stuck on the wooden chair - and buying another two chairs would not only be totally ridiculous pandering to our two already spoilt cats and rather expensive, but would also over fill the dining room. We don't have the space. Thanks for the good wishes. I really am on the mend now, but am glad I only work a three day week...and also that it is half term so no college tomorrow night, so I can just be a bit lazy. Thanks Annie - Max is rather lovely (and he knows it). 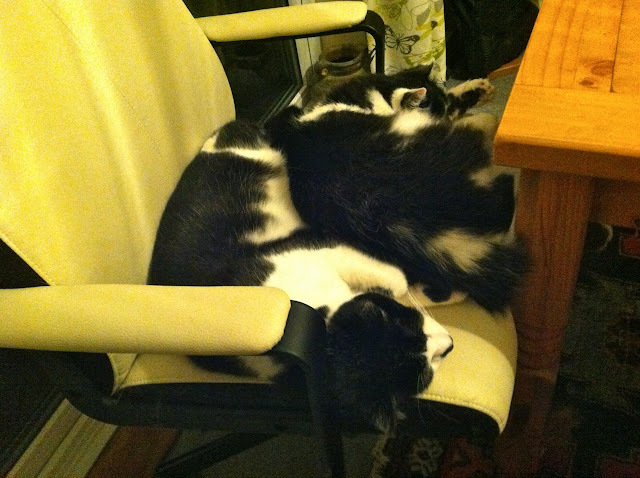 There have been times when his brother got to the chair first and Max sat on top of him until Rio gave up and moved.